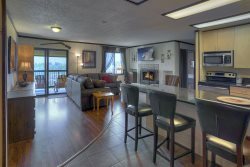 Durango Colorado vacation rental home known as the Downtown Cottage. Walk about seven blocks to Historic Main Avenue for entertainment, shopping, dining, activities and attractions, the Durango Welcome Center for tourism information, and, of course, the famous Durango & Silverton Narrow Gauge Railroad and Museum. No need to worry about parking for downtown activities as you can park at this home and walk to most points of interest in the Historic District. The home includes a newly remodeled kitchen, 2 bedrooms with queen size bed in one bedroom and a queen size bed in 2nd bedroom, 3/4 bath, full size laundry, and a large front parlor which include the living room and dining room. The Victorian era home includes a covered front porch on a residential neighborhood street and a fenced backyard with outdoor dining, a gas grill and room for two vehicles to be parked inside a gate with alley access. This recently remodeled two bedroom home was originally a coal miner's home back in a time when coal was mined from nearby mountains to heat homes, fuel the train and the ore mining operations that once took place in Durango. Great location! Easy check in and check out process. Perfect size for a couple visiting town.